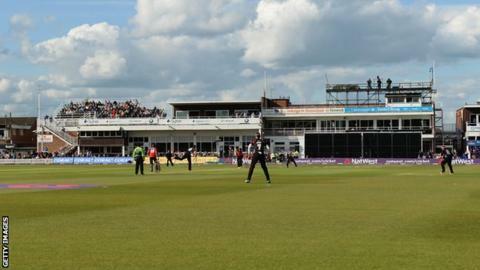 Leicestershire hope to complete installation of six floodlights at Grace Road in time for the 2016 T20 Blast competition, says chief executive Wasim Khan. The county are in the process of obtaining the required planning permission for the project. Khan has previously stated the club's aim to renovate the ground over a three-to-five year period. "We've started the process now," Khan told BBC Radio Leicester. "There's £500,000 available from the ECB to support that in terms of installation. Durham recently added lights to their Chester-le-Street home, opening up new international cricket opportunities and enabling day-night games. "We're moving forward in terms of getting planning permission, how many floodlights we need - we've had that assessment done and we need about six floodlights putting in," Khan added. "If the T20 gets moved a bit later in the summer, then it will give us a longer period to get those lights installed." Why is it going wrong in Europe? Read more on Champions League: Why are English teams struggling?